31 December 2014 - Jan Kees Blom has painted three more textures for the Mirage IIIC from Restauravia. All three represent Mirage IIIO units of the Royal Australian Air Force wearing a camouflage paint scheme. 30 December 2014 - Jan Kees Blom has painted five repaints for the Mirage IIIC from Restauravia. Included are a Mirage IIIC of EC 1/2 'Cigognes', a Mirage IIICZ of the South Africa Air Force, and three fictitious repaints; Mirage III0 of the Royal Australian Air Force OCU and 77 Sqn., and a Royal Netherlands Air Force Mirage III. 29 December 2014 - It is with a sad heart that I report the passing of Benoît Dubé. Benoît passed away at 17:05, December 26th, at Hôtel-Dieu de Montréal hospital. He died in peace, surrounded by his wife, his sons, his brothers and sisters and other member of his family. Benoît was very involved with the flightsim hobby working on flight models. Benoît and I corresponded for many years and worked together on the English translations of manuals for the Royal French Navy group and Restauravia. 25 December 2014 - May you and your loved ones enjoy the true meaning of Christmas and have a prosperous New Year. Let's all give thanks for what we have and pray for a more peaceful year in 2015. 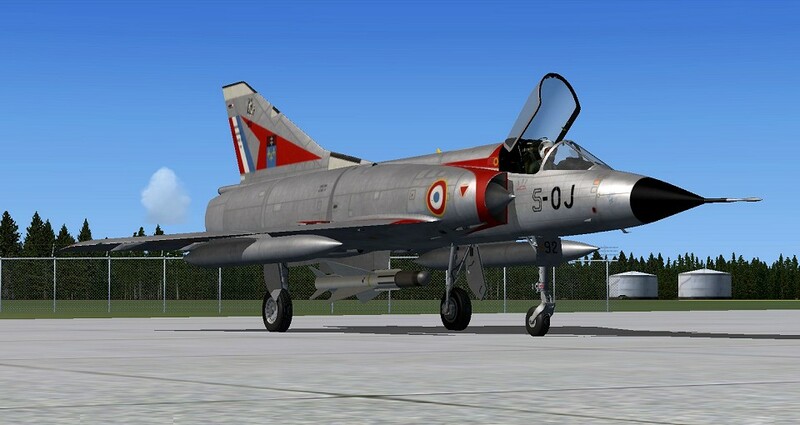 23 December 2014 - Restauravia have released their new Mirage IIIC for FSX/Acceleration and P3D. The package features seven liveries and several external tank/weapons options are available. Please see the preview page for more information. The aircraft will be an exclusive download from the Restauravia website. 20 December 2014 - Christoph Tantow has painted four more fictitious texture sets for the beta version of the upcoming Mirage 2000C from Metal2Mesh. Included are Japan, Indonesia, Spain, and the Royal Air Force. 18 December 2014 - I put up the annual Holiday Season's Greeting on the Home page. Also Harry Biard, Alejandro Ramirez, and Bernard Leuenberger have completed a new scenery for Borderaux Merignac (LFBD) as it appeared in 1961 with the civilian and military sections and the Dassault factory facilities. The Super Mystère B2 of Wim Regeer and the Mirage IIIB/C of Mike Pearson are used to "populate" parts of the scenery. 15 December 2014 - L'iguane has repainted the FS2004 Mirage IIIC of Beat Schaffner in the Armée de l'Air blue air defence scheme and markings of EC 1/10 'Valois'. 12 December 2014 - "edhave" has put together flight plans for Belgian Air Force Mirage 5 during 1987. The flight plans are for use with the repaints of Chris Brown of the AI Mirage 5 by Mike Pearson. 10 December 2014 - L'iguane has repainted the MD.450 Ouragan of Thinus Pretorius in the marking of the Fuerza Aerea El Salvador as it appeared in the 1980's. 7 December 2014 - I have removed the entries for the Rafale updates by Mohammad Faali after being reminded that the the aircraft should not have been repackaged and are only to be downloaded from specific websites according to the original developer's requests. I have also found instructions for importing the Rafale M by Bruno Mérelle (Thor's Hammer) from into Prepar3D and combining it with the FSX Acceleration FA-18 virtual cockpit. The instructions are similar to those for FSX but also include the DLL gauge file. 4 December 2014 - Chris Brown has painted textures for the Mirage 5BA, 5BR, and 5BD of the Belgium Air Force for the periods of 1987 and 1990. The textures are for use with the BAF Mirage 5 by Mike Pearson. 25 November 2014 - Christoph Tantow has painted five fictitious texture sets for the beta version of the upcoming Mirage 2000C from Metal2Mesh. Included are Chile, Germany, Norway, Switzerland, and the USAF. 19 November 2014 - Bob Chicilo has updated the Rafale A/C of Cyril Pioffet for FSX. Included are flight model improvements and updates to the instrument panel. 13 November 2014 - I have had the opportunity to again preview the latest beta build of the upcoming Mirage IIIC from Restauravia. Two new models have been added: a Mirage IIIC(DJ) with Matra Magic missiles and a clean version with no weapons. The interception radar has now been added. See the Preview Page for more information. 8 November 2014 - Antonio Diaz has painted two new sets of textures for the Super Étendard Modernisé of Romain Lucas. The first represents a special scheme for the 100 Year Anniversary of the Aeronavale. The second represents a special scheme worn by a Super Etendard assigned to 59S Flotille. 1 November 2014 - Chris Brown has painted 43 textures for the Mirage F1B/C of EC 12 at Cambri-Epinoy AB from the 1980s. The textures are for use with the AI Mirage F1 by Nick Black. 28 October 2014 - Bob Chicilo has updated the Rafale M of Cyril Pioffet for FSX. Included are flight model improvements, panel changes, adding an optional second instrument panel, and a carrier operations tutorial. 23 October 2014 - Antonio Diaz has painted a set of textures for the Super Étendard Modernisé of Romain Lucas. They represent a black and gold 40th Anniversary scheme. 17 October 2014 - Bob Chicilo has updated the Rafale M of Cyril Pioffet for FSX. Included are flight model improvements, instrument panel changes, an optional instrument panel, and a carrier operations tutorial. 12 October 2014 - Mohammad Faali has repackaged the Super Étendard Modernisé of Romain Lucas for FSX. Four French and one Argentina texture are included. No credits for the textures or the instrument panel update are included. 10 October 2014 - "edhave" has put together flight plans for the Mirage F1C/B, EC 12 at Cambrai AB in 1988. The flight plans are for use with the Mirage F1C/B repaints of Chris Brown for the Mirage F1 by Nick Black/Mike Pearson. 27 September 2014 - Mees Jansen has repainted the Rafale C of Cyril Pioffet in a special Tiger scheme worn by EC 1/7 'Provence' at the NATO Ocean Tiger Meet 2014 event. The package is complete with flares, smoke, upgraded AB and some panel updates. 19 September 2014 - Christoph Tantow has painted another set of textures for the Mirage IIIB of Restauravia. The fictional textures represent an aircraft in NASA Starfighter markings. Only the textures are included so you will also need the base Mirage IIIB aircraft. 4 September 2014 - Gert van B. has created a scenery for Tanagra AB (LGTG) in Greece. It was home of the Hellenic Air Force Mirage F1's and now their Mirage 2000's. Requires the MAIW Greek F-4 package for buildings. 27 August 2014 - Stéph24 has painted a set of textures for the Rafale M of Bruno Mérelle (Thor's Hammer) in the marking of the 90th Anniversary of Flotille 11F. The tail textures are reversed and on the wrong sides so I have made a Quick Fix. 10 August 2014 - Stéph24 has completed two sets of 2014 NATO Tiger Meet textures for Rafale C/M by Roland Laborie. The first represents a Rafale C of EC 1/7 'Provence'. The second represents a Rafale M of Flotille 11F. 7 August 2014 - Christoph Tantow has painted another set of textures for the Mirage IIIB of Restauravia. The textures represent an aircraft in fictional markings of 31 Stormo of the Italian Air Force. 3 August 2014 - Christoph Tantow has painted another set of textures for the Mirage IIIB of Restauravia. The textures represent an aircraft in fictional markings from the Royal Danish Air Force. Only the textures are included so you will also need the base Mirage IIIB aircraft. 27 July 2014 - SkyDesigners have released a new scenery package for FSX. The subject is BA 125 - Istres Le tubé "Charles Monier" (LFMI). The scenery includes a photorealistic base with accurate AFCD and airfield buildings modeled from real world photos. 20 July 2014 - Alessio Spahni has repainted the Mirage IIIB from Restauravia as a Mirage IIIBA in the colors of the Fuerza Area Argentina. 15 July 2014 - Christoph Tantow has painted a new set of textures for the Mirage IIIB of Restauravia in the markings of JG71 'Richthofen'. Although fictional, the Mirage IIIB includes the gray/green splinter camouflage pattern of the 1970's Luftwaffe. 12 July 2014 - Alessio Spahni has repainted the Mirage IIIB from Restauravia as a Mirage IIIBS (J-2004) in the colors of the Swiss Air Force. 10 July 2014 - Flightsim.com has published an interview with Thinus Pretorius of South Africa. Thinus has been a long time internet friend of myself and contributor to this website. Over the years Thinus has given us many original models of the MD450 Ouragon, Mirage IIICZ, Mirage IIIEZ, Cheetah C, and Cheetah E.
27 June 2014 - Chris Brown has painted 52 textures for the Mirage F1CR of ER 33 at Strasbourg AB and with the CEAM at Mont-de-Marsan AB from the 1980s. The textures are for use with the AI Mirage F1 by Nick Black. 21 June 2014 - Metal2Mesh continues their open beta for early purchasers of their upcoming Mirage 2000C. I've been flying her around and checking out the features. A few new schemes have been made available to beta testers as well. 13 June 2014 - The end of an era. Today marks the final day of flight of the Mirage F1 in Armée de l'Air service. The ceremony at Mont-de-Marsan AB will include a special flight of three F1CR and one F1B in special tail colors. This video shows them in earlier flight. Adieu beau Mirage. 5 June 2014 - To supplement his firefighter's income Zsolt Beleznay has decided to release his latest Mirage repaints as donation ware. He has painted several new schemes for the Mirage III, Mirage 5 and Kfir all based on the Mirage III/5 of Mark Harper. UPDATE: Because Mark wants repaints made using his paint kit to remain freeware I have removed the listings. 23 May 2014 - Joel Maillot had updated his PAN CDG Toulon scenery to include the arrestor cables, FLOLS, and catapults of the latest RFN Carrier gauge. 12 May 2014 - I recently had the opportunity to test fly a preview of the upcoming Mirage IIIC from Restauravia. Following their very well received Mirage IIIB, their Mirage IIIC already is much anticipated. Please see the Preview Page for more information. 7 May 2014 - Chris Brown has also painted 40 AI textures for the Mirage F1CG of the Hellenic Air Force from the 1980s. 30 April 2014 - Chris Brown has painted 78 textures for the Mirage F1CE and F1BE of the Ejercito del Aire in the "lizard" camouflage from the 1980s. The textures are for use with the AI Mirage F1 by Nick Black and updated by Mike Pearson. 24 April 2014 - Another slow month (the real world has kept me busy) but some possibly incredible news has come to my attention. If I read it correctly, Restauravia (of Mirage IIIB and soon Mirage IIIC fame), announced that they are considering the Mirage F1 for a future project. Thank you Bertrand Barbé for bringing this to my attention. 28 March 2014 - It has been a very slow month for new Mirage subjects. I have been too busy with real life to work on anything myself but there are some outside activites I have learned about. VectorSimWorks is working on a new Rafale B for FSX under the project name RafX. And SkyDesigners is working on a Rafale B F2/F3 cockpit for FSX. Perhaps for VectorSimWorks or maybe modified for Bruno's Rafale? 5 March 2014 - SkyDesigners have released a new scenery package for FSX. The subject is BA 103 Cambrai-Epinoy (LFQI), former home of the famous EC 1/12 Cambrésis. The scenery includes a photorealistic base with aircraft (Mirage 2000C) and airfield buildings modeled from real world photos. 18 February 2014: Stéph24 has completed two sets of textures for Rafale C/M by Roland Laborie. The first represents a Rafale C of EC 01/002 'Cigognes' at Luxeuil-les-Bains. The second represents three Rafale C of EC 01/030 'Alsace' at Mont de Marsan. 12 February 2014 - The first file of AI Traffic using the new Super Entendard AI aircraft of Nick Black has been released. It represents the Aviones Armada Argentina Etendard based at Base Aeronaval Bahia Blanca (SAZB). 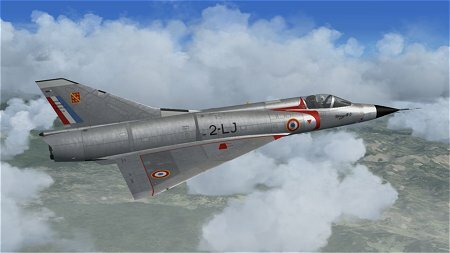 17 January 2014 - Zsolt Beleznay has painted a new set of textures for the Mirage IIIB of Restauravia in the markings of EC 05-330 'Côte d'or'. Although fictional, the Mirage IIIB includes the blue/gray camouflage pattern of the Mirage 2000. 10 January 2014 - Stéph24 has repainted the Rafale C/M of Roland Laborie. The texture set represents a Rafale C of EC 1/7 'Provence' at St Dizier AB in 2013 NATO Tiger Meet markings. 3 January 2014 - Jan Kees Blom has repainted the Mirage IIIB from Restauravia in the marking of the RAAF. The aircraft represented is a Mirage IIID of the 2 OCU at RAAF Williamtown. 1 January 2014 : Best wishes and Happy New Year to All!